Today's technology offers some of the most innovative ways to have great window accessories in your home. Do you wish you could open or close your blinds with just a push of a button? Well it is now possible and simpler than ever to do so. Whether you are in the middle of renovating your home, or would just like to make minor upgrades, motorized blinds are a step forward to turning your home into a smart home. With motorized blinds, you no longer have to deal with convoluted cords or strings. You can let light in and keep light out of a given room with a simple remote control or panel. Install motorized blinds for your bedroom, living room, kitchen, or another room in the house. There are, in fact, three types of DIY motorized blinds you can buy, and there are advantages and disadvantages to each one that you should be aware of before taking the final decision. A battery wand blind is a popular choice for motorized blinds. It is solely a small wand that is powered by 8 or more lithium ion AA batteries. Lithium ion batteries are used so that they do not melt over time when exposed to sunlight. Depending on how you mount these blinds, they can be installed above, next to, or behind the shade. The batteries will last about a year before they need to be replaced, which is one of the battery wand's caveats to be aware of. The sun has made living better, now than ever before. Solar powered window accessories contain rechargeable batteries that are installed behind the window, and will gain energy with exposure to sunlight. There is no need to use external lift cords since the shades can be raised and lowered and the slats can be adjusted solely on the power of the sun. Solar powered blinds are fairly easy to install, and do not require an electrician by any means. The problem with today's sun powered DIY motorized blinds is that they do not last as long as you would expect; they are can only be installed for a year or two before they decide to slow down. Hard wired blinds are, simply put, blinds that are connected to a remote or control panel on the wall via a wire. These wires have 110 volt power that will go directly inside your outlet. You may need the help of an electrician to install these motorized blinds, and they will contribute to your electricity bills. However, hard wired blinds have much stronger connections than battery powered blinds, making them more responsive, more reliable, and they will last much longer. You do not need to keep buying new batteries or get your blinds replaced every now and then. Buy it once and it will last for a number of years. All motorized blinds that operate with a remote control work on radio frequencies; similar to garage door openers. You can program motorized blinds so that you can map one channel to each blind; pushing a certain button will roll up or down a specific blind. Motorized blinds can also be programmed to all roll up and down at once with a single button. 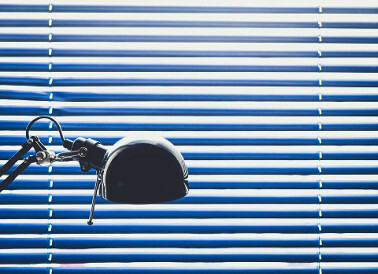 In addition, motorized blinds can also roll up and down on their own at a certain time of day or with enough sunlight, so they will only open when necessary, blocking out the sun's heat and reducing your energy bills for air conditioning.